Scalar Wave Laser revolutionary new low level laser quantum healing cold laser device. The Scalar Wave Laser combines the most advanced cold laser technology with state of the art scalar wave technology. The unique Pulsar Lasers come in red, infra red and violet wavelengths. These have violet crystal technology and are scalar wave enhanced. 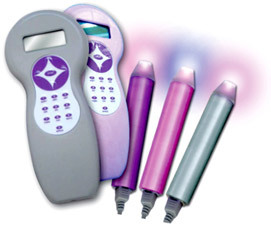 The Family Scalar Laser Set is designed for families, wellness centers and communities. This set comes with two Scalar Lasers and one of each of the Pulsars and the Viopulsar. The Viopulsar is a revolutionary and first of its kind violet laser diode probe. It uses proprietary Scalar Wave Technology along with a 70 mw violet laser diode. Experience Planet Earth's newest quantum cold laser rejuvenation technology. The Scalar Wave Laser combines the most advanced low level laser technology with state of the art quantum scalar waves. The Scalar Wave Laser System is approved by the FDA and is indicated for temporary relief of minor muscle, joint and arthritic pain, muscle spasm and stiffness, promoting relaxation of muscle tissue, and to temporarily increase local blood circulation. The Scalar Wave Laser uses the newest cold laser technology, free shipping and DVD training, a fantastic Quantum Referral opportunity, financing and all the help you need to help get you up and running. Give is a call today to speak with one of our Scalar Wave Laser Customer Care Specialists.